There are so many reasons to love Autumn – whether you love the crisp cool air, golden leaves, or snuggling up in your favourite knitwear. 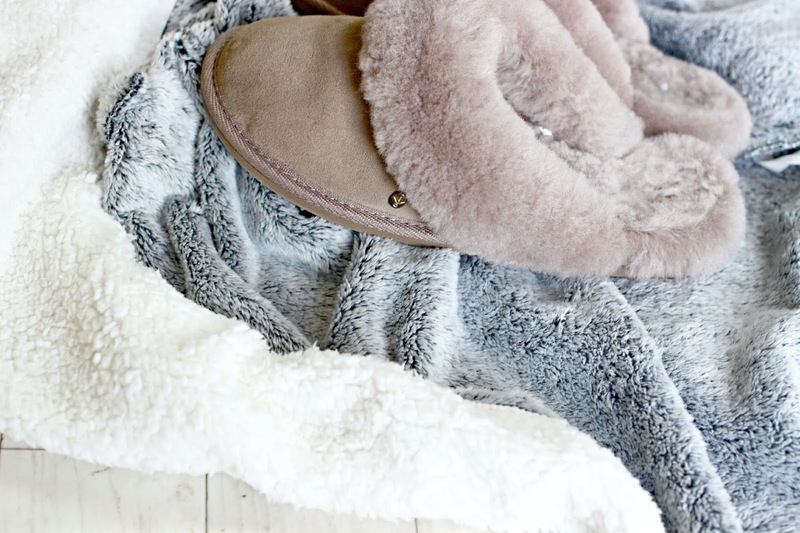 Another reason to love Autumn is allowing yourself some little luxuries, so get cosy because today I’ve compiled my ultimate Autumn comforts to make the next few months feel like the snuggliest Autumn ever! 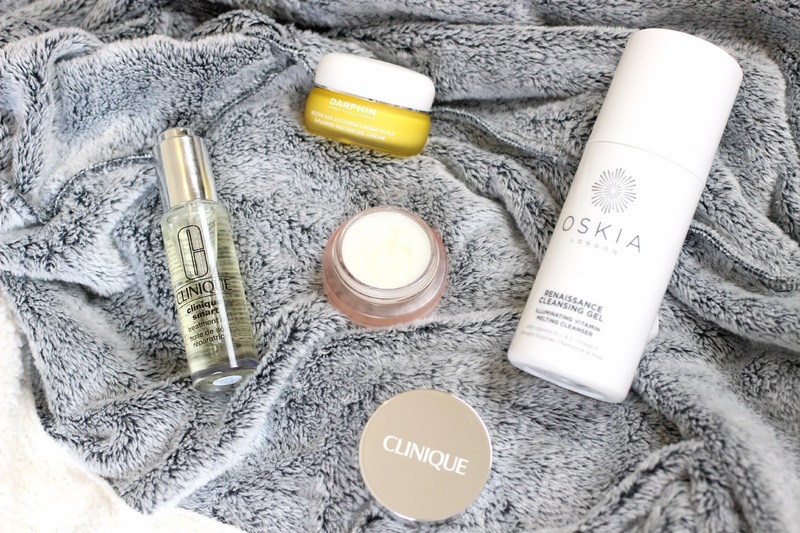 Firstly, Autumn skincare. I absolutely love the luxurious texture and sumptuous softness of the products that I use in Autumn. Your skincare should be switched up to comfort your skin after it has been exposed to the harsh elements of Autumn! Wind, rain and a drop in temperatures mean your skin should be nourished with a luxurious cleanser such as the Oskia Renaissance Cleansing Gel which is gentle on the skin and also nourishes and repairs skin from environmental damage, leaving your complexion feeling clean, balanced and heavenly soft. Another staple in my routine is the new Clinique Moisture Surge Melting Mask Balm. When the harsh weather leaves skin feeling dry and irritated, the balm works to restore comfort and radiance back into your skin. I apply as a 10 minute mask once a week, or leave it on overnight when my skin needs some extra attention. Also part of the new Clinique All About Oils collection is the Smart Treatment Oil which I’ve been applying onto skin after cleansing for some serious conditioning and repair, together they leave my skin looking and feeling lovely and plumped and nourished instead of sad and chapped! The product that I most look forward to using in the evenings is the new Darphin 8-Flower Nectar Oil Cream. A hybrid between an oil and a cream, it has a similar heavenly scent to the Darphin oils which I’ve raved about previously on the blog and transforms from a sumptuous cream to a delicious oil when massaged onto the skin. Ideal for this time of the year, skin immediately feels comforted and thoroughly moisturised – plus as with other Darphin products it feels like an absolute luxury to use. In Autumn, it’s often the simple details that can bring the ultimate luxury and comfort. 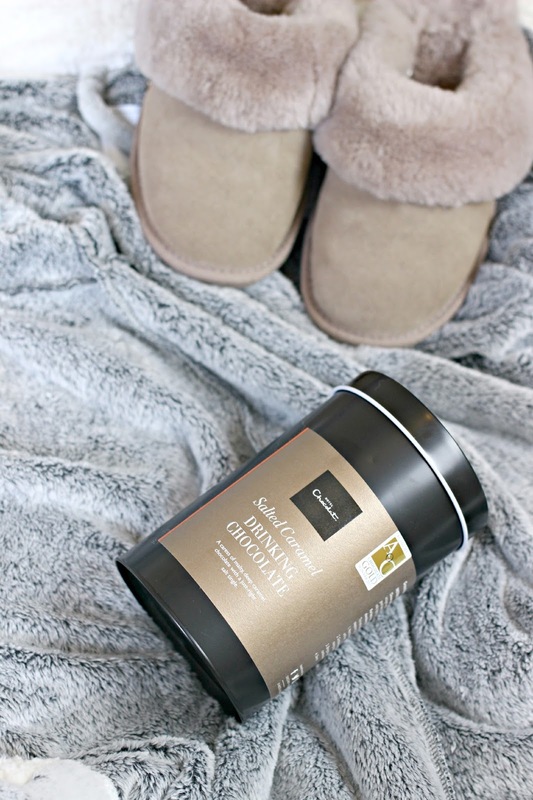 Aside from Dexter (who is the greatest hot water bottle / cold evening snuggler in the world), a few things which make me feel warm and cosy include my super-soft Emu slippers, and even softer New Look dressing gown, and, a new discover; the Hotel Chocolat Salted Caramel Drinking Chocolate which really does taste as good as it sounds! 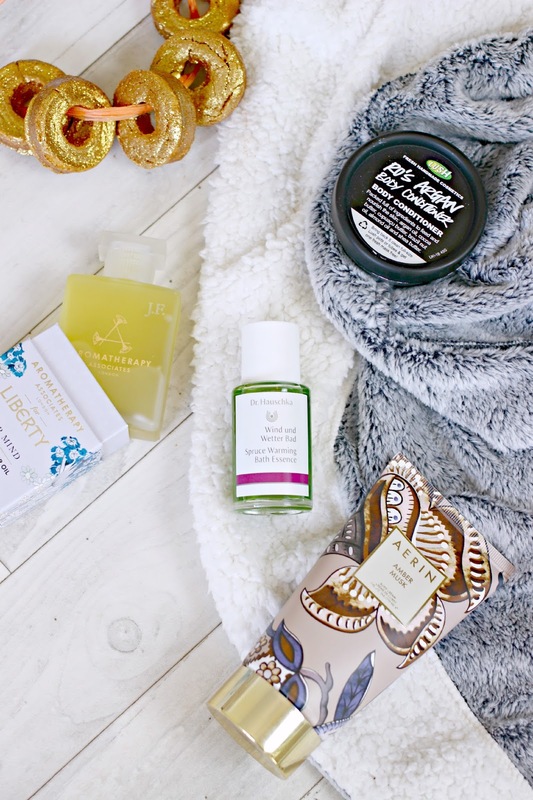 A bath is a luxury which I try to afford myself once a week, making the time to soak in the tub is the ultimate Autumn Comfort and choosing some lovely bath products can make it a seriously luxurious experience! I’ve been trying out some new Bath Oils recently with heavenly fragrances, including the Aromatherapy Associates Bath & Shower Oil which contains heavenly ingredients such as chamomile and lavender which help to instantly relax you while also clearing the mind. It’s exclusive to Liberty, and if you look closely you can see that my little bottle is even personalised with my initials engraved in the top corner! The Dr Hauschka Bath Essence is another with a scrumptious scent – I always thought this brand was super expensive but this Bath Essence is under £10! It’s designed for recovering from cold and windy days, with oils which bring long-lasting warmth to your body, inside and out! Various Lush products have found their way into my bathroom recently after I discovered their range at the Christmas Launch event, and bath times have been hugely improved with their bath bombs including these vanilla scented Five Gold Rings bubble bars which soften the skin while you soak. After bathing, I reach for my most luxurious body lotions, and my current fave is is the Aerin Amber Musk body lotion, yet another product with a gorgeous fragrance which lingers on the skin for hours after application. The greatest part of chilly Autumn evenings is snuggling up under the duvets, preferably with a Netflix series ready for viewing! 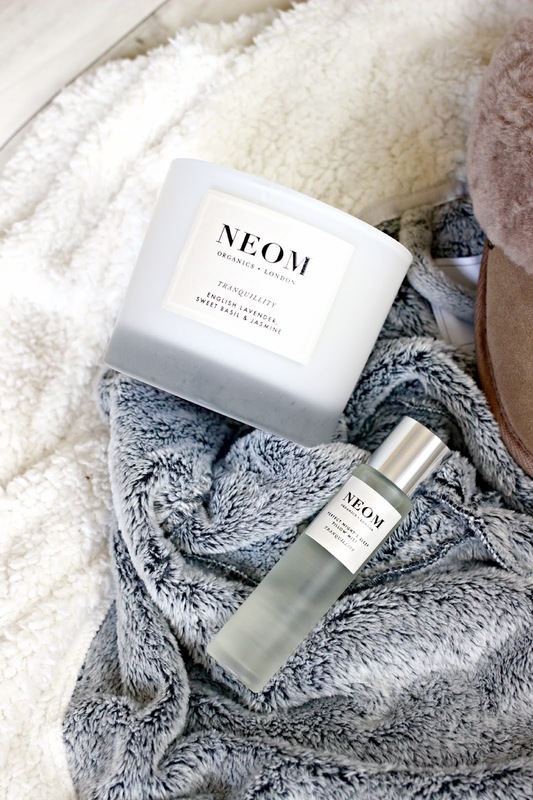 Lighting a candle or two and misting the room with a calming spray is the greatest thing for a cosy evening, and Neom have released a Tranquility range; the English Lavender, Basil and Jasmine candle and matching Pillow Mist. Part of their Scent to Sleep initiative, the fragrances are all chosen for their sleep inducing properties and even after the most stressful day, it’s hard not to feel utterly relaxed once the room is filled with the lovely fragrances! 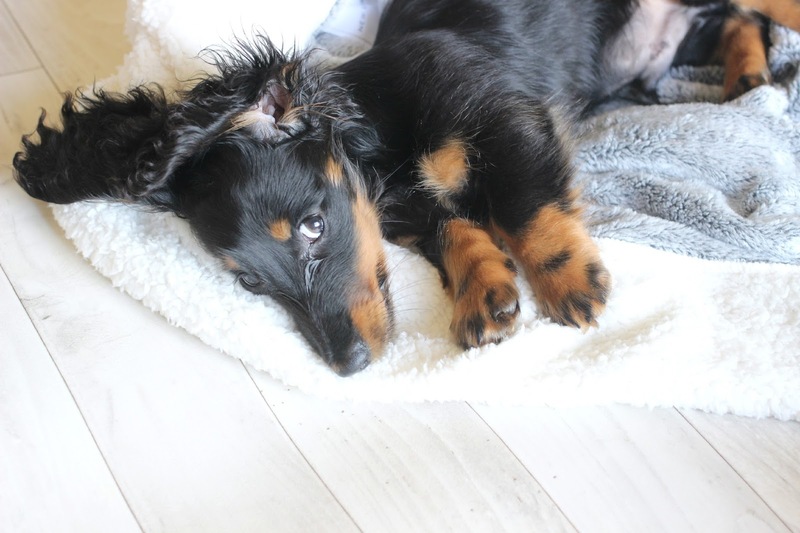 What are your Autumn Comforts?